Magnificent instrumental music from the same stable as Genesis, Hackett, Greenslade and The Enid! If you are a fan of keyboard driven symphonic instrumental Prog Rock of anything from Genesis / Steve Hackett to The Enid / Greenslade, I can tell you without a word of a lie, you are going to be bowled over by ‘Journey Of The Yak’. Over the past couple of years we have heavily promoted the two albums by Willowglass, both of which have gone on to be major sellers at CDS, and this Yak CD is going to go the same way, because it falls into the same Symphonic Prog category, but probably it’s even better! Yak play instrumental Progressive Rock and hail from Essex in the United Kingdom. The band was originally formed in Loughton/Ongar in 1982 as a four-piece, but folded in 1984. Over the next 20 years, the music was kept 'alive' by keyboard player and Yak composer Martin Morgan and finally in 2004 a CD called 'Dark Side Of The Duck' was released, featuring 8 of the original Yak tracks with the band emulated electronically on keyboards. Following this and the positive web reviews of the music, the band got back together. Two further CD's were released, one in 2005 and one in 2006. These were both ‘live’ recordings of rehearsals/jam sessions in those years. In late 2007 Martin Morgan got together with drummer Dave Speight to work on new Yak material. Dave plays drums for Peter Banks (ex-Yes) and Nick May's band Whimwise (ex- Enid) as well as featuring recently with Yesterdays, the Hungarian progressive rock band. Together with Gary Bennett on bass, this album was recorded between April & August 2008, and now CDS Towers has discovered it for your listening pleasure. ‘Gates Of Moria’ opens the album with some eerie sound effects, before a host of synth melodies and sweeping electric guitar themes raise from the horizon a spread themselves over the soundstage in gloriously dramatic fashion to provide a real dream opening for this ‘Journey Of The Yak’ album. ‘Entangled In Dreams’ starts out in very ‘Trick Of The Tail’ period Genesis territory with the sounds of jangling electrified acoustic guitars, Mellotron flutes and piano, but as the track develops with the use of Hammond organ sounds, the influences go back further to take in ‘Foxtrot’ and ‘Selling England’ period as well, and of course the Mellotron sounds cover both periods anyway – An amazing piece of symphonic prog that is certain to excite all Genesis / Hackett fans, and have everyone gagging to hear what is still to come. ‘Jadis Of Charn’ starts out with an ethereal passage of fantastic eerie, atmospheric keyboard work then the Hammond and soaring synths kick in to lift the track up on to an exciting driving prog-rock plane with more Genesis sound-a-like instrumental work that also has snatches of Greenslade coming through at times as the bass and drums tightly drive the keyboards melodic forces along in tight and dynamic fashion. ‘Dearly Departed’ is a beautifully sublime sombre piece that obviously means a lot to Martin. The 1st half is simply a piano melody, then for the 2nd half Mellotron flute, sweeping synth strings and percussion provide a heavenly symphonic finale. 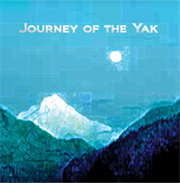 ‘Journey Of The Yak’ closes the album with a Greenslade meets Steve Hackett meets The Enid style of track with soaring guitars and big production keyboards driving a angelic theme up to the heavens. Extra meat comes from the organ, but it’s the multi-layered soaring guitar leads that take the prize here, closely followed by the deep synth brass and Tony Banks—esque synth leads. It all comes to one absolutely glorious big climax that will leave you breathlessly amazed at how such a vast sound such as this can be achieved by just a trio of musicians – AMAZING! Now, here’s the big shock… there are no guitars on this album!!! – No, you won’t believe it, but it’s true! It was as much a shock for me to learn this - after having listened to the album first without referring to the sleeve credits - as it will be to you… or maybe not now, because I’ve gone and told you haven’t I!! Such is the scope of Martin Morgan’s keyboard talents. So why haven’t we heard this guy before? I don’t know, but the really important thing is we have now, and I’m sure once you hear this amazing CD you are going to be looking for more from him too. It’s not always that easy for a totally instrumental album to hold our interest for almost fifty minutes, but this one does it with flying colours, and pretty easily at that!